Yevgeny Bezruchenko, a two-time world open water swimming champion and the director of Moscow’s MySwimSchool, shares some of the secrets of marathon swimmers with Moskovsiye Novosti. For many people, summer means a trip to the beach and lots of time in the water. And then there are those for whom long days spent in the open water is a way of life. Yevgeny Bezruchenko was born in 1979 into a family of professional swimmers. He’s been swimming wince he was six years old. He was the world 5km and 10km world champion in 2000 and 2001. Bezruchenko currently organizes personal group training sessions all over the world. Yevgeny Bezruchenko, a two-time world open water swimming champion and the director of Moscow’s MySwimSchool let Moskovsiye Novosti in on some of the secrets of marathon swimmers. It’s important for marathon swimmers to know how to fight for their place and choose the right position for an attack. Sometimes they need to jostle, and work with their fists. The main thing is not to hit anyone’s eyes. One time I was in Argentina and my hand got caught in a plastic bag that someone had thrown away. I was in the lead, just 25 meters from the finish, but that bag cost me 15 hundredths of a second. You need to grease your body to keep it warm in the cold water (and also to increase your speed). No one will reveal what the precise composition of their preferred grease is. It’s mainly a mix of Vaseline and rendered fat, but some people also add some talc. Strong swimmers only grease certain groups of muscles that might give them problems. Long-distance and ultralong-distance open-water swimming began at the end of the 19th century. The most famous open-water swim is the 21 mile swim across the English Channel. In 1991, the first world championship of open-water swimming was held, and since 2008 there has been an Olympic 10km event. The first Olympic women’s champion in this event was Russian Larisa Ilchenko. An eight-time world champion, Ilchenko is considered as the best female open water swimmer today. 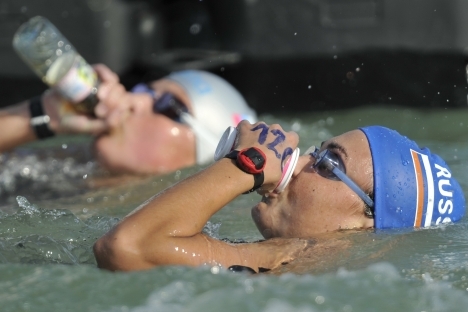 In 5km races, the swimmers don’t take anything to boost their strength, because there isn’t time, but if you’re swimming 10km or 25km you need food. No one ever tells anyone what’s in their food, not even their friends: It’s a secret. This food mainly consists of energy gels, energy drinks and carbohydrate-protein drinks. The main problem is how to use this food during the race. Lots of people tuck little packets of food into their swimming trunks. The other way is to take your food from a special raft in a little glass or bottle, but it can happen that you can’t get to the raft where your coach is, because people are shoving you. To cope with this eventuality, swimmers put little packets of concentrated gel into their trunks. There have been cases where dolphins have swum with the competitors. As for sharks, I’ve never come across a single attack. In 1998 in Australia a big shark swum up to the group of leaders for a kilometer but then turned back and swam away. In principle there are always helicopters circling above the swimmers, and there are support launches nearby, so that if anything comes they can chase it away. Very few of the male swimmers talk about this, but the girls shriek, of course. There are lots of sharks in San Francisco Bay in September–October, they come looking for seals. But when more than 1,000 people jump into the water at the same time and start swimming, they would frighten anyone away. The article is abridged and first published in Russian in Moskovskiye Novosti.